PAC’s Oneprox Proximity Keypad Reader offers outstanding reliability as it is housed in a tough polycarbonate UV polymer compound making it virtually vandal resistant and ideal for vandal prone areas. It can deliver read ranges up to 120mm and operates from 10.5 to 18 VDC. 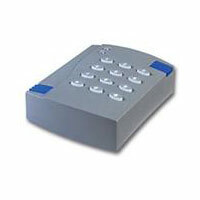 The PAC’s Oneprox Proximity Keypad Reader has two LED’s, Green and Red. When the reader is active a red light is shown but when it senses the presence of a valid key or card a green light appears to indicate that access has been granted.